For the past month I have been trying to come up with a new Hamantaschen recipe that no one has done yet. Easier said than done! The kosher bloggers community has come up with every possible Hamantaschen recipe you could possibly think of. So I really had to put on my thinking cap to come up with these Laham Abjeen Hamantaschen. There are so many awesome Hamantaschen recipes on Kitchen Tested and Kosher in The Kitch! Laham Abjeen have always been one of my favorites. I tried them once at a fancy bar mitzvah kiddish and I instantly fell in love with them. 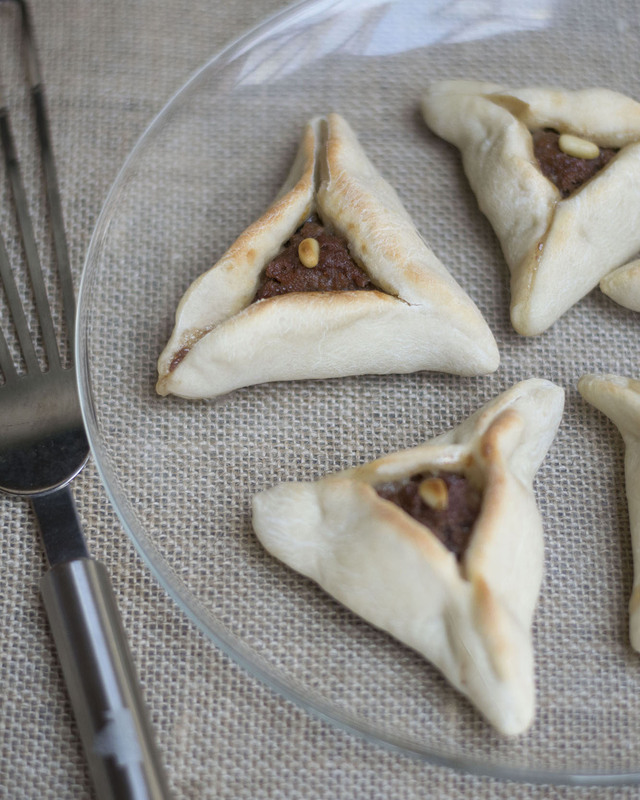 My Laham Abjeen Hamataschen are a great, savory version of everyones favorite Purim cookie. They add a Persian flare to your Purim Seuda! To make dough, combine the flour and salt in a large mixing bowl. Add the dissolved yeast and mix well. And the vegetable oil and mix again. Gradually add 1 cup of warm water, kneading until a soft dough is formed. Cover with a clean towel and let rest in a place warmer than room temperature for 1 hour. Preheat the oven 350 Degrees Fahrenheit. To make the filling, combine the beef, onion, tomato paste, lemon juice, tamarind, allspice, and salt. Mix well. Once the dough has risen, remove a ball of dough, 1 inch in diameter, and place it on a lightly floured surface. Using a rolling pin roll it out until it is 5 inches in diameter. Spoon a heaping tablespoons of the meat filling into the center of the rolled out dough. Next, pinch the edges together to make a triangle. Bake for 20 minutes or until the top starts to brown on a baking sheet lined with parchment paper.